Hope you are having a great day. So its festive season and Diwali will be here before we know it, I thought which not start with the DIY Diwali Decor. So here are my DIY T-light holder. The gold flower T-light looks great not only on Diwali but all year round. I love to decorate my house for a festival and ofcouse Diwali is my favorite. So to start giving a festive tough to the house, here is how you can make yourself these T-light holders. 1. Small plastic or glass glasses. 1. Take your spoons and cut off the handles. 2. Now spray spoons (both sides) with the paint of your choice, I choose gold. 3. Let them dry completely. 4. Now come in with your glue gun, make sure its super hot. 5. Now take one glass, start glueing spoons one by one with hollow side inwards. 6. Stick then a little below middle, leaving a little space on glass below them. 7. Once one layer is done, stick second by placing the spoon where two leaves from first row join. 8. Repeat the same for third layer. 10. Now spray one thin layer of paint covering the glass inside out, the gaps between spoons and spoons too. 11. And there you have your beautiful gold flower T-light holders. Just put in a electric T-light and you ate done. 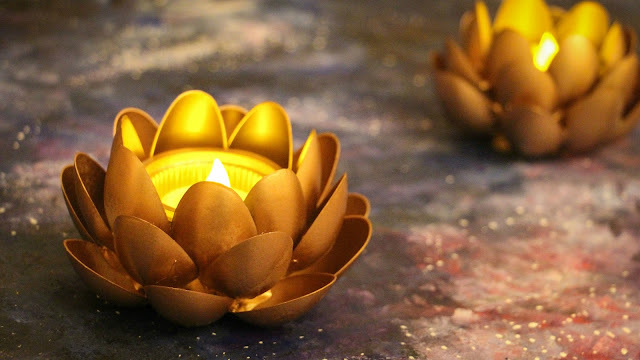 These gold flowers T-light holders are perfect for a coffee table or to decorate in your room. No matter if you light them or not, they are a great decoration. 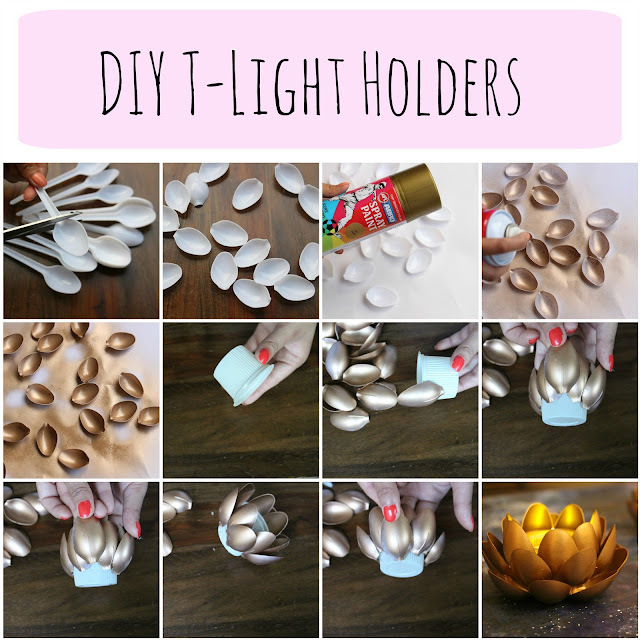 This easy DIY Diwali Decor, the T-light holders hardly take any time to make. Hope you like my #DIYdiwalidecor for #30daysofdiwali .